or run it in dev mode with npm i && npm start and load the extension&apos;s folder ./dev. or build it with npm i && npm run build:firefox and load the extension&apos;s folder ./build/firefox (just select a file from inside the dir). just specify REDUX_DEVTOOLS in electron-devtools-installer. Note that starting from v2.7, window.devToolsExtension was renamed to window.__REDUX_DEVTOOLS_EXTENSION__ / window.__REDUX_DEVTOOLS_EXTENSION_COMPOSE__. Note that preloadedState argument is optional in Redux&apos; createStore. For universal ("isomorphic") apps, prefix it with typeof window !== &apos;undefined&apos; &&. For TypeScript use redux-devtools-extension npm package, which contains all the definitions, or just use (window as any) (see Recipes for an example). Note: Passing enhancer as last argument requires redux@>=3.1.0. For older versions apply it like here or here. Don&apos;t mix the old Redux API with the new one. 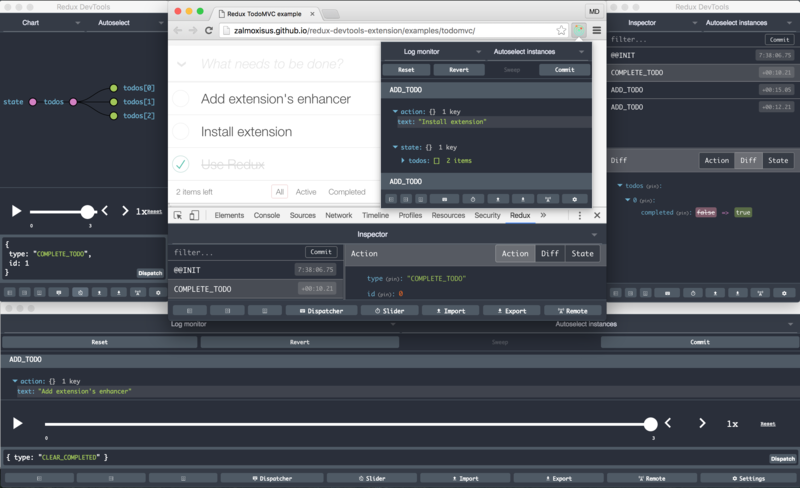 You don&apos;t need to npm install redux-devtools when using the extension (that&apos;s a different lib). Note that when the extension is not installed, we’re using Redux compose here. There’re just few lines of code added to your bundle. It&apos;s useful to include the extension in production as well. Usually you can use it for development. You&apos;ll have to add &apos;process.env.NODE_ENV&apos;: JSON.stringify(&apos;production&apos;) in your Webpack config for the production bundle (to envify). If you use create-react-app, it already does it for you. If you&apos;re already checking process.env.NODE_ENV when creating the store, include redux-devtools-extension/logOnly for production enviroment. If you don’t want to allow the extension in production, just use redux-devtools-extension/developmentOnly. For React Native we can use react-native-debugger, which already included the same API with Redux DevTools Extension. For most platforms, include Remote Redux DevTools&apos;s store enhancer, and from the extension&apos;s context menu choose &apos;Open Remote DevTools&apos; for remote monitoring. See integrations and the blog post for more details on how to use the extension with any architecture. If you like this, follow @mdiordiev on twitter.